Joel has a shot of Bryn, the last pygmy rabbit who died in 2008. It was nearly blind and missing half an ear. His shot captures the feeling of an animal who probably new the end was coming (died a few months after shoot). The line is unfortunately gone (except for some hybrids they are trying to reintroduce), but having captured that shot through the viewfinder must have been a window to the soul. There is actually a fly (the Delhi Sands Flower-Loving Fly) of which there is less than 1,000 left. This is where recovery becomes a sticking point – as much as I am for a the recovery of wolves, it seems hard to get behind a fly, but it is difficult to take sides in this battle – I will say the act of photographing this insect was interesting – he had to get a permit to capture ONE and only ONE fly from the US Fish and Wildlife Service. If that fly was injured or flew off before the shot, that was tough luck. The federally permitted fly handler was able to capture one and knock it out with CO2 gas. This allowed them to put it in a makeshift portable studio where he was able to capture it on black velvet before letting it go. We will have to check out the International Crane Foundation in Baraboo, Wisconsin the next time we go snowboarding at Devil’s head. Apparently a shortage of blue crabs along the Texas Gulf Coast led to the starvation and death of many Whooping Cranes (North America’s tallest bird) over the winter. Shockingly, there was just an article in our local paper about a recent rare sighting of 5 young Whooping Cranes at a local wildlife refuge! 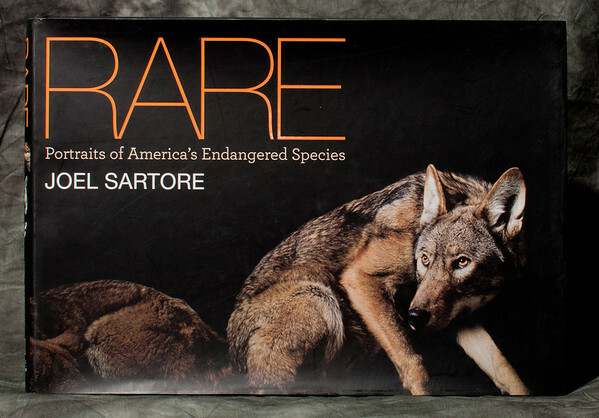 Already mentioned the Red Wolf is down to around 330. They actually rounded up all the remaining ones in 1970 and started a captive breeding program – those 14 wolves kept their race alive and now over 100 of them roam free throughout five counties in North Carolina. Apparently the wolverine doesn’t like to have his pictures taken. They built whitewashed 1″ plywood walls at a New York Zoo only to have it demolished by the wolverine within minutes. They were eventually able to get it done using thin white sheets of paper instead which it was willing to walk across. Spotted Owl burgers are the tongue in cheek menu item in some Pacific Northwest logging communities – This owl actually competes and sometimes mates with the Barred Owl. That pretty much sums it up. Take a gander if you get a chance, I don’t know how receptive you will be to the message, but at least give a look appreciate the pictures and.. well, make up your own mind. Some of these population numbers are pretty scary. I know someone who belongs to the International Crane Foundation and travels up to Wisconsin to see the young cranes led off by the ultralight to train them for migration. I assume you meant “301 habitats endangered”. I did know that about military bases—the old Joliet Arsenal area that was given to the state and is now under restoration as the Midewin National Tallgrass Prairie is somewhere I intend to visit. I had no real interest in grasslands until I found that so many cool birds nest in them. I see the Fat Pocketbook is listed as endangered in Illinois—ain’t that the truth. I wish someone could send me a postcard from Africa with just my name and country on it and it would appear in my mailbox. Very impressive. That’s how I’m going to send your Christmas card–why write out all those pesky details? A friend of mine from work (John) was just informing me about the ultralight training – I had no idea. He also said they have crane muppets to feed them so they get accustomed to their natural feeding – it definitely sounds like a cool place to visit. I had a mistype with the 301. I looked it back up and it was supposed to read 301 threatened (not endangered) – sorry about that and thanks for the catch. I have to admit, I thought you were joking with the Fat Pocketbook comment – sure enough it is actually real – how totally IRONIC being in a completely broke state – I am guessing the next Illinois endangered listing will be the very rare Honest Governor. 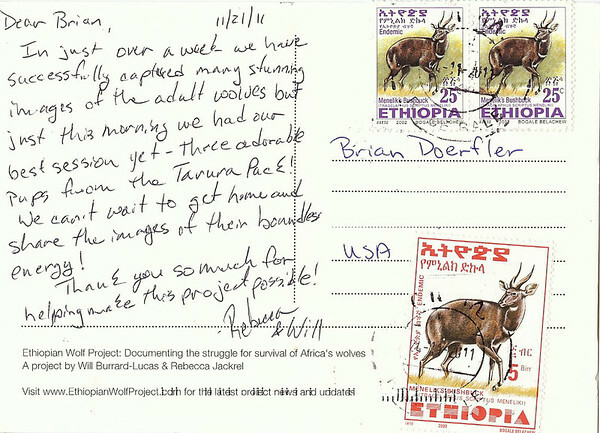 As far as the postcard goes, I didn’t know you had to put an address on it – all my mail simply comes to Brian in the USA (usually doesn’t have the last name, they must have been slightly concerned at the Ethiopian post office so added a that extra bit of information).